Every journey has its own story to tell. As they say, for travelers it’s the journey that’s important and not the destination. 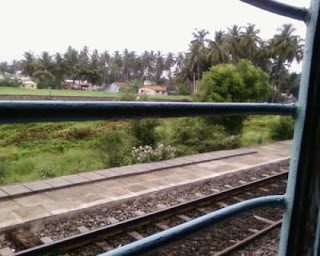 This post is about those several musings in the several journeys in Train. Local trains are a huge gift to Mumbai and Chennai (Of course Delhi too). Once in Mumbai I had to catch a particular train to reach office on time and I was already late to reach the station. I was wearing a pair of high heeled formal shoes and I managed to run with it on. Well, didn’t manage so well. I skidded and fell down with the bang. I couldn’t get up and I was sitting there for a while and people surrounded me to help me get up. I love Mumbaikars for that neverending love. They are like that. I somehow got up and my back was paining badly. I wondered if I should proceed to office or get back home. I said to myself I had to proceed as just to catch the train, I fell down. I caught it! My backache never subsided for a whole day. It was a Thursday and I took an off on Friday and had 3 days leave. I started medication almost 10-15 Brufens in 4 days and no relief. I went to the Doc who finally said, my tail bone is a gone case. Its either compressed or broke and I had to take and X-ray to find that out. Yes, it was compressed. He told me to make myself comfortable with cushions for sitting in office for atleast 2 weeks. I asked if I would be fine after that. He said that I would get used to the pain!!! Till date, it pains if I don’t change position for hours together…!!! This happened a year and a half ago!!! Another day in Mumbai Local, I was standing near the door as usual if I don’t get a seat. But wrong position, I took the sunny side. With overwhelming morning peak hour rush and the heated compartment with summer sun, I got boiled completely. Almost near the station where I had to get down I blacked out. I somehow managed to get down. I sat down in the chair in station. My ears were blocked. My eyes had blacked out. My head was swirling. I called my colleague who usually takes that route. But that day, he had already reached office. I didn’t want to disturb him and I didn’t call him. I got a bottle of water and drank it completely and in half an hour I was ok. I took a taxi for that walkable distance to office. At noon I told that colleague what happened and he blasted at me for not telling in the morning itself. Well, he blasts at me till date for that incident. Another incident was during Holi in Mumbai local train. Mumbaikars know of it very well. People throw water balloons everywhere. That’s Mumbai’s Holi specialty. Trains are never spared. Whoever is near the door or window are sure to be drenched by that water balloon. The worst part is going to office drenched like that. I escaped it narrowly when my neighbor got drenched completely and I got through with just droplets. Once when I and a friend of mine were to Manori and he was new to Mumbai, I took his hand in mine and led him everywhere as every station in Mumbai is severely packed and he didn’t know Hindi and I didn’t want him to lose track. At one point of time, he said “Who of us is a guy and who is a gal..???”. Ohhhhhhhh…. Local trains in Chennai esp. ladies compartment are a huge plaza and shopping street by themselves. Everything from flowers to accessories to jewellery to kids clothing to food stuff to almost literally everything that could be carried in hand. At dead cheap price as well. Not just these, long distance trains have their own parcel of experiences as well. Musings in Hyderebad Train was already said in an earlier post. So now starting with a train journey to our Capital city New Delhi. It was a family trip with my parents in my 12th grade and quite unusually the whole compartment was filled a college gang. It was one of the leading southern Teachers Training College and our compartment was filled with the guys and the next compartment was filled with gals. And we were only 5 of us – the general population in that compartment. So as per their request we shifted to one cube, so we can have our privacy and them too. It was long 36 hr travel from Chennai to New Delhi in Train and as typical college students are they too were singing and dancing and making merry. And of course when a gang joins together and sings, its only the beats that is considered and not the lyrics and they ended up in a vulgar song. In course of the journey a group of fellows became friendly with us and I caught one of those and slowly started enquiring. Me - “So, what subject would you teach once you finish this course…???”. He – “All subjects except languages of primary school kids…”. Me – “Ok… Interesting… So would you also be teaching these vulgar songs to those kids as well…???!!!!!”. His facial reaction – Priceless…!!! He went in to his friends and I dunno whatever he said but after that they took care of the choice of the songs too…!!! During the return journey, opposite to me was an army cadet. As typical army cadets are, he too was young, handsome, well built with chiseled facial features. At Nagpur, where third genders beggars are seen, he was quite much irritated by them. Poor soul. Not wanting to hurt them, he didn’t shout at them but it was funny to see him trying to hide his shyness. Another sad thing was during our college trip to New Delhi about which I had posted earlier itself , we had to celebrate Holi in train without any dancing, singing or merry making. And also trying to get food from the famous Comessum Restaurant in Nagpur station was running back and forth to our compartment was quite freaky. Yes, I did not miss the train too…!!!!! Once when I was travelling from Karur to Chennai the train’s departure was delayed by half-an-hour. Reason – Bomb hoax. And am enjoying every trip looking out of the window and seeing greenery, people, sometimes even monuments and astonishing the loads and loads of changing cultures across the length and breadth of India and proud to be a part of this country of rich cultural heritage. Travelling by train it's a great experiense by itself! phew you travel a lot. Train journeys are always fun. I wonder how you girls walk on needle, you gals must be given an award hehehe. Very nice and interesting post. Its really horrible to travel by train specially at Mumbai. But I feel its quite comfortable to travel by train at Delhi. Train journeys are very much tedious. We are very pleased to inform you that our readers can now sip your blog at blogchai.com every day, 24 by 7 by 52.177457* (unlike the passing digg listing! ). Happy blogging! More and more readers! More and more wisdom sharing! If you like our service kindly consider a link or a badge (available in our blogchai site) so that we will grow together. Cheers! "your daily cup of blog chai!" * As per Google Search Term "weeks in an year" ! lol! Of course, its a great fun.. Btw, Walk on needle..??? U mean our stilletto heels..??? I dont feel its so horrible even in Mumbai (even - as its worser than Chennai or Delhi). Coz I get to observe maximum no. of people and things (U know, garments, bags, accessories etc etc etc.) in Mumbai. Thanks Neelima for dropping by. Guess this is your first visit here. Glad I could remind you of those sweet memories.. Welcome to my blog dear. Thanks for dropping by and commenting. Do drop in often. I'd love your visits comments. I love this long distance train journey. I will be off to Thiruvanthanpuram for Dushera holidays by train. I understand your back pain as I also suffer from lower back pain. I am on exercise and medicines. Take care of your back. You spoke so much about Nagpur but there was no mention of buying oranges at the Nagpur railway station. I used to travel by train from Raipur to Bhopal via Nagpur. I would buy one full basket of oranges for about Rs.50 and take it home. We not only ate well but also distributed the oranges to the neighbors. Nagpur oranges are very famous for sweetness and they are quite cheap in Nagpur. I used to travel from Satna to Singrauli by train with a coal engine. The smoke and coal dust will go into my eyes and spoil my shirt. Besides, in summer the train will get so hot that I had to take of my shirt and sit with the banian for the entire journey. Another funny thing on this route is that the villagers will board the train with goats and chicken and firewood. They made so much noise in the train. When the train reaches near their houses they will just pull the chain and the train will stop. They will get down with all their belongings and vanish in the bushes. These people also never bought tickets. They will give the ticket checker some money and he will gladly let them ride in the train. In Jabalpur railway station one con man took Rs.200 from me saying that someone robbed his purse and he has no money to travel home. He promised on all his gods that he will return my money as soon as he reaches home. He took my visiting card also which has my address. But I never got my money till date. Train journeys are always interesting. I have an old post in my blog where I have narrated how an innocent woman was robbed in the train. You also tackled those boys singing vulgar songs very well. This reminds me about an incident when I was traveling from Goa to Kochi by train. Some engineering students got into the train at Trichur and started bullying an old lady who was traveling alone. The bullying was so bad that the old lady was almost on the verge of tears.Every one in the compartment felt very sad but no one including me had the guts to tell the rowdy students not to misbehave with the old lady. Many thanks for this interesting post which made me narrate some of my own old stories. Extremely interesting. I hope you are now cured of the ailment or getting used to the pain. Just returned from Mumbai after been there for three weeks. I felt bad reading about your injury. Rest of the blog evoked memories from more than 25 years ago when I perhaps went on my last long distance train ride in India. Overseas train rides, at least in the US on Amtrak is not the same. I have fond memories of those trips we did from Mysore to Delhi, Calcutta, Bombay and so on when we were young. Did a lot of trips with friends even in college. I remember that each station had something special about it. Lonavla Chikkis those days were really famous, as were Agra Petas and Kachoris in Kasara (On the Bombay - Igatpuri line - did that in 1980!). I don't know how it is anymore but would love a train ride if I get a chance. Thanks for bringing out these memories in your blog. Please take care. This brought back many fond memories of the many journeys I made (over 25 years ago!) on the Grand Trunk Express and Tamil Nadu Express (Madras-Delhi and back). Wow. Thank you. Thanks a lot for taking time to write this long and wonderful comment. I am so glad, I could remind you of so many of your interesting incidents and experiences. Yes as you had said, I left about oranges. It was big nosecut and we planned to buy oranges on our return journey and god known in which platform our train stopped without a single hotel or orange vendor available...!!!!! Welcome back. You are commenting after a long time. Thanks for dropping by again. Reg the prob, its ok now. It dosen't pain anymore unless I keep sitting for several hours together. I know its not fun at all... :( So sorry to hear you too faced the same problem... Hope u r fine now..
Its all the same. Agra Peta, Mathura Pedha, Madurai Idli's... Its all so special..